HARARE, Dec 9 2014 (IPS) - As unemployment deepens across this Southern African nation and as the country battles to achieve the United Nations Millennium Development Goals (MDGs) ahead of the December 2015 deadline, thousands of urban Zimbabweans here are facing starvation. Zimbabwe has a total population of just over 13 million people, according to the 2012 National Census – of these, 67 percent now live in rural areas while 33 percent live in urban areas. Social workers find the stay of urban dwellers in Zimbabwe’s cities justifiable, but ridden with hardships. According to Philip Bohwasi, chairperson of Zimbabwe’s Council of Social Workers, urban starvation is being caused by loss of jobs – the World Food Programme (WFP) estimates unemployment in Zimbabwe to be at 60 percent of the country’s total population. “The current inability of the economy to address people’s basic needs is leading to hunger in most urban households, with almost none of urban residents in Zimbabwe affording three meals a day nowadays,” Bohwasi told IPS. True to Bohwasi’s words, for many Zimbabwean urban residents like unemployed 39-year-old qualified accountant Josphat Madyira from the Zimbabwean capital Harare, starvation has become order of the day. “Food stores are filled to the brim with groceries, but most of us here are jobless and therefore have no money to consistently buy very basic foodstuffs, resulting in us having mostly one meal per day,” Madyira told IPS. Madyira lost his job at a local shoe manufacturing company after it shut down operations owing to the country’s deepening liquidity crunch, thanks to a failing economy here that has rendered millions of people jobless. The donor community, which often extends food aid to impoverished rural households, has rarely done the same in towns and cities here despite hunger now taking its toll on the urban population, according to civil society activists. “Whether in cities or remote areas, hunger in Zimbabwe is equally ravaging ordinary people and most of the donor community has for long directed food aid to the countryside, rarely paying attention to towns and cities, which are also now succumbing to famine,” Catherine Mukwapati, director of the Youth Dialogue Action Network civil society organisation, told IPS. Apparently failing to combat hunger in line with the MDGs, over the years Zimbabwe has not made great strides in eradicating extreme poverty and hunger due to the economic decline that has persisted since 2000. As a result, earlier this year, the U.N. Children’s Fund (UNICEF), in partnership with the Zimbabwean government, extended its monthly cash pay-out scheme to urban areas. Under this scheme, which started at the peak of Zimbabwe’s economic crisis in 2008, families living on less than 1.25 dollars a day receive a monthly pay-out of between 10 and 20 dollars, depending on the number of family members. 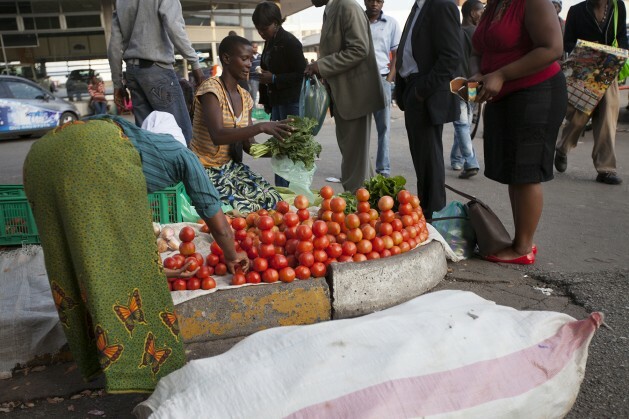 Economists and development experts here say that achieving the MDGs without food on people’s tables, especially in cities whose inhabitants are fast falling prey to growing hunger, is going to be a nightmare, if not highly impossible for Zimbabwe. “Be it in cities or rural areas, Zimbabwe still has a lot of people living on less than 1.25 dollars a day, which is the global index measure of extreme poverty, a clear indication that as a country we are far from successfully combating hunger and poverty in line with the U.N. MDGs whose global deadline for world countries to achieve is next year,” independent development expert Obvious Sibanda told IPS. According to the 2013 Human Development Index of the U.N. Development Programmer (UNDP), Zimbabwe is a low-income, food-deficit country, ranked 156 out of 187 countries globally and UNDP says that currently 72 percent of Zimbabweans live below the national poverty line. Although hunger is now hammering people in both urban and rural areas, government sources also recognise that the pinch is being felt more by urban dwellers. “The decline in formal employment, mostly in towns and cities, with many workers engaged in poorly remunerated informal jobs, has a direct bearing on both poverty and hunger, which is on a sharp rise in urban areas,” a top government economist, who declined to be named, admitted to IPS. For the many hunger-stricken Madyiras in Zimbabwe’s towns and cities, meeting the MDGS by the end of next year matters little. “Defeating starvation is far from me without decent and stable employment and whether or not my country fulfils the MDGs, it may be of no immediate result to many people like me,” Madyira told IPS.